RYA VHF Course and RYA VHF online course information. VHF? SRC? DSC? What’s up with all the three-letter acronyms when it comes to marine communications? If you’re a newcomer to sailing and you’re struggling to get you head around it all, we’ve put together a quick introduction to the world of marine radio – and what you’ll need to start broadcasting on the open water. What is a marine VHF radio? Marine VHF radio (also known as the VHF maritime mobile band) refers to the range of radio frequencies between 156mhz and 174mhz, which are used by vessels and ports to communicate. The equipment used to transmit and receive communications on these frequencies is technically called a ‘VHF set’, but many sailors simply call it a ‘marine radio’ or ‘VHF radio’. Sailors use VHF radio to share information on navigation, skippers’ intentions, weather conditions, vessel traffic (particularly the presence and location of larger ships) and other potential hazards. VHF is also crucial in the event of an on-board emergency, as it allows you to transmit a distress call to other radio users. Modern VHF sets include ‘digital selective calling’ functionality (‘DSC’) which can be used to quickly send out a text-based distress signal with your boat’s coordinates. Why is it called VHF? It’s short for ‘very high frequency’ – the name of the 30mhz to 300mhz radio frequency band which marine radios use to communicate. 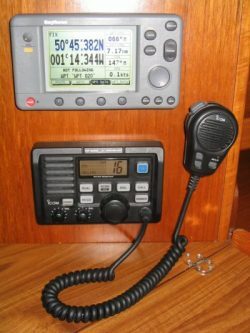 Do I need a VHF set? Why can’t I use my phone to communicate? With a VHF set, you can broadcast your communication to everyone in your vicinity. With a mobile phone, you’ll need to have the person’s number in order to call them, and you have limited options for multi-person calls. Mobile phones work well on land, since you’re surrounded by various stations and signal boosters which allow for reliable long-distance communication. It’s a very different story at sea; and in an emergency situation, you don’t want to find yourself without a mobile reception. Unlike a mobile call, the coastguard can use the signal of your distress call on VHF radio to track down your location – especially if you’re using DSC! The average mobile phone won’t survive a splash from a stray wave or a dip in the ocean – and the sea air isn’t particularly good for it, either. VHF sets are designed to be waterproof; and if they fall overboard, they’ll float long enough for you to rescue them from the waves. What is the RYA SRC Certificate? The RYA Marine Radio Short Range Communication Certificate (also known as a VHF licence) is an official certificate issued to those who have completed the RYA SRC course and exam. As mentioned earlier, you’ll need SRC certification before you can legally use a VHF radio set. The course covers all the essentials of marine radio communications; including how to operate a VHF set, and the correct procedures for broadcasting a distress signal. You can take your SRC course online or in person with an RYA-recognised training centre (although your exam will need to be taken in person with an assessor). As well as any course fees charged by your training centre, there’s also a £60 fee for taking the SRC exam (which is paid to the RYA to cover the admin side of issuing your certificate). At Ocean Sports Tuition, the SRC certificate course is usually £99 per person – but, for a limited time only, if you’re interested in taking an RYA Powerboat Level 2 or RYA Day Skipper Motor course, you can earn your VHF course at no extra cost*. To find out more or to book a course, call our team on 02381 242159 today!